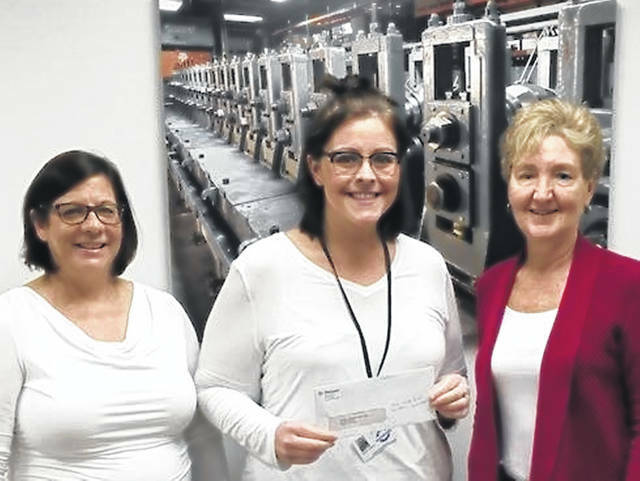 The Pennant Molding Company in Sabina recently donated $1,000 for the Clinton County Foster Children’s Trust Fund. This fund, under the Clinton County Foundation, assists children at Christmas time and throughout the year by providing opportunities they would otherwise be unable to have. The Trust Fund helps foster children with summer camps, sports equipment, clothing, and school necessities. Pictured from left are Lisa Massie, Job and Family Services’ Child Protective Unit permanency supervisor, Jessica Ladnow, permanency caseworker, and Kathy Rupp, plant manager of Pennant Molding.